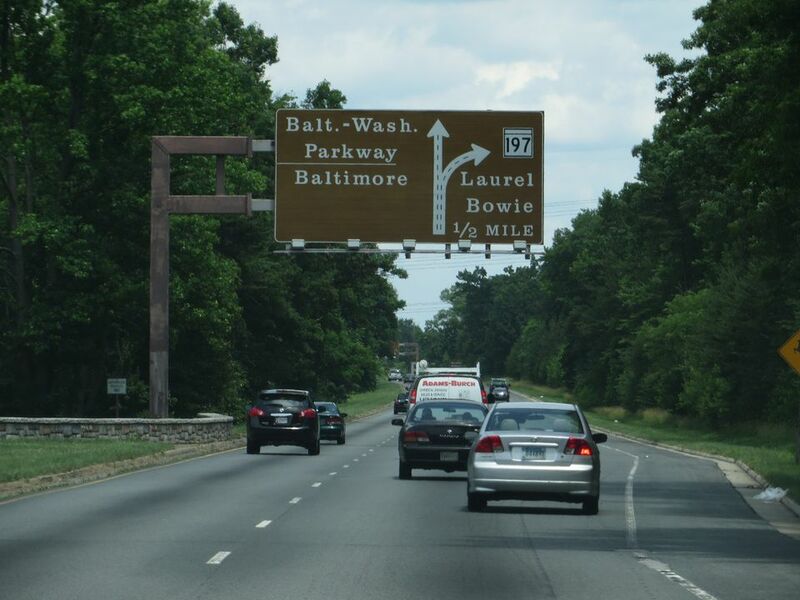 The Baltimore–Washington Parkway, also known as MD 295, is a 29-mile highway that runs southwest from Baltimore to Washington, DC. The road begins at Russell Street in downtown Baltimore and continues southwest to an interchange with U.S. Route 50 and Maryland Route 201 near Cheverly in Prince George's County at the Washington DC border. After crossing into DC, the road becomes the Anacostia Freeway (I-295) and continues for 8 miles until it connects with I-95 and the Capital Beltway (I-495). The northern section of the road is maintained by the Maryland State Highway Administration and is dedicated to Gladys Noon Spellman, a U.S. Congresswoman who represented the 5th congressional district of Maryland from 1975 to 1981. Trucks are allowed to travel on this portion of the Parkway. The southern portion of the Parkway to Maryland Route 175 is maintained by the National Park Service. Trucks are prohibited along this section. Baltimore Washington International Airport: The airport is located off of I-195, at the northern end of the Baltimore Washington Parkway. It is about an hours drive to downtown DC. With approximately 650 domestic and 22 international flights daily, BWI offers travel options to visitors and residents. Arundel Mills Mall: The outlet shopping mall features more than 200 stores including Kenneth Cole Outlet Store, F.Y.E., Off 5th Saks Fifth Avenue Outlet, Bass Pro Shops Outdoor World, Banana Republic, Liz Claiborne, and Old Navy. Fort Meade: The U.S. Army installation includes the Defense Information School, the United States Army Field Band, and the headquarters of United States Cyber Command, the National Security Agency, and the Defense Courier Service. Goddard Space Flight Center: Located in Greenbelt, Maryland, the facility is a major U.S. laboratory for developing and operating unmanned scientific spacecraft. The Visitor Center houses interactive exhibits and offers special programs and events that highlight Goddard's Earth and Space Science, engineering, and technology work. Greenbelt Park: The national park offers outdoor recreational opportunities and a campground which is open all year round. Anacostia Park: The national park has shoreline access, a swimming pool, ball fields, trails, picnic facilities, and the Anacostia Park Pavilion with public space for roller skating and special events. Kenilworth Park and Aquatic Gardens: The park is dedicated to water plants such as water lilies, water hyacinth, lotus, and bamboo. National Arboretum: The Washington DC attraction displays 446 acres of trees, shrubs, and plants and is one of the largest arboretums in the country. Exhibits include formal landscaped gardens, Gotelli Dwarfs, an extensive bonsai collection, seasonal exhibits, aquatic plants, and more. Fort Dupont Park: The 400-acre park is a popular place for picnics, nature walks, gardening, environmental education, music, skating, sports, and ranger-led Civil War programs. Boiling Air Force Base: Located 3 miles south of downtown Washington, DC, the base is the headquarters of the Air Force District of Washington and home of the 11th Wing. Oxen Hill Farm: The historic property offers farm activities and wagon rides. Visitors, such as demonstrations learn about the dairy cow and other farm animals or take a wagon ride through the natural areas of the park. National Harbor: The mixed-use development is located along the Potomac River off of I-95, near the intersection of I-295 and the Capital Beltway (I-495). It is home to the Gaylord National Resort and Convention Center, restaurants, retail stores, hotels, condominiums, a full-service marina, and commercial office space.